The highest performing organizations and most beloved brands of our time have a purpose beyond making money. Companies with a Purpose are motivated by the idea of making a positive difference in the lives of the people they serve. Program is suitable at the basic level for individuals desiring to enhance their organization's alignment of management practices and reinforcement of ethical behavior. OK Ethics makes no guarantees as it is up to the individual practitioner to determine relevance to their specific area of practice. Congratulations to Thomas Hill, CEO of Kimray, as the 2019 Executive Pilot Honoree. Thomas will be honored at this special Awards event. Roy Spence is Co-Founder and Chairman of GSD&M, a leading marketing communications and advertising company. He is also Co-Founder and CEO of The Purpose Institute, a consulting firm that helps people and organizations discover and live their purpose. Along with Haley Rushing, Roy co-authored the Wall Street Journal bestselling book, “It’s Not What You Sell, It’s What You Stand For: Why Every Extraordinary Business is Driven by Purpose.” And, most recently he authored “The 10 Essential Hugs of life,” a collection of heartwarming reminders about the need for gratitude, love and goodness. 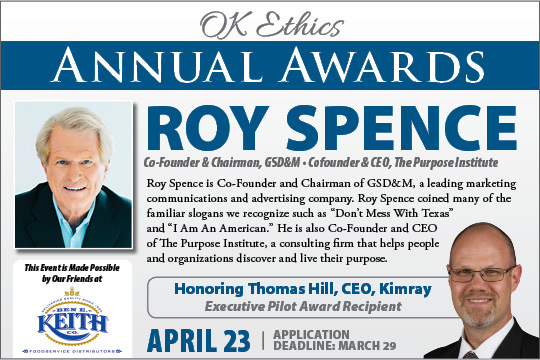 Under Roy’s leadership, his agency has helped grow some of the world’s most successful brands like “Don’t Mess with Texas,” Southwest Airlines, Wal-Mart, DreamWorks, the PGA TOUR, BMW, the U.S. Air Force, L.L.Bean and the Clinton Foundation. Roy has been a trusted advisor to legendary leaders including Sam Walton and Southwest Airlines founder, Herb Kelleher. His counsel has also been sought by U.S. presidents and leaders in the State Department. Roy is also a Gallup Senior Adviser working with their teams on global strategy and on the mission and purpose of the most important companies and institutions in the world. He is Gallup’s expert on Purpose. In addition, Roy is a marketing and communications advisor of the National Advisory Council for the Trust for the National Mall. Roy’s passion is entrepreneurship. He deeply believes that entrepreneurship is the miracle of America. His mantra is “Don’t Do Mild” in work or life; follow your dreams, follow your passion, and follow your purpose. Click here for extended bio. • Flying with Herb Kelleher, founder of Southwest Airlines. • Riding with Sam Walton, founder of Walmart. • Driving with BMW and the PGA TOUR. • Plowing with John Deere. • Defending freedom with the United States Air Force. • Designing with AIA a Blueprint for Better. • Donating time and talent to create compelling public service awareness (PSA) ads to mobilize goodwill to help people in the moments that matter the most, like Katrina, the earthquake in Haiti, the terrible floods in Baton Rouge and recently, filming and producing PSAs with the five former presidents for hurricane relief for the victims of Hurricanes Harvey and Irma. Consider co-hosting this event or purchasing additional tables. Contact Jalisha (405) 889-0498 or Shannon at (405) 858-2233. Many thanks to our friends at Ben E. Keith for co-hosting this event!